Markings: The left side of the barrel is marked “SPORTING / P. BERETTA – MADE IN ITALY / 12 GA. 2 3/4 AND 3 IN. SHOT SHELLS – 30 IN.”. The left of the receiver is marked “PATENTED” and “P. Beretta AL391 Urika”. The right of the barrel is marked with Beretta’s three-line warning address. The right of the receiver is marked with Beretta’s arrows and rings logo, “AL391 Urika – 12 GA.” and with the serial number. The bottom of the receiver in front of the loading port is marked with three Italian date codes and “BM” in square date code. The front of the forend at the gas vent is marked “BERETTA” in gold. Choke: The barrel is threaded for removeable chokes. The installed choke is Improved Cylinder. Also included are Cylinder, Modified, Improved Modified and Full. Sights / Optics: There is a white bead in a base at the front of the rib with a smaller steel mid-bead. The top of the receiver is serrated and the top of the rib is finely checkered to reduce glare. Stock Configuration & Condition: The stocks are a two piece checkered walnut set with a capped grip and textured solid black rubber Beretta buttpad. The stocks have no notable wear or damage, only light handling marks. There are no chips or cracks. The checkering is sharp. The LOP measures 14 3/8” from the front of the trigger to the back of the buttpad. The pad has some very light wear, in about Fine-Excellent condition. The stocks rate in about Excellent overall condition. Bore Condition: The bore is bright, there is no erosion. Overall Condition: This shotgun retains about 99% of its metal finish. There is no notable wear or damage, only light handling marks. The pin heads are unmarred. The markings are clear. Overall, this shotgun rates in about Excellent condition. Mechanics: The action functions correctly. We have not fired this shotgun. As with all used firearms, a thorough cleaning may be necessary to meet your maintenance standards. 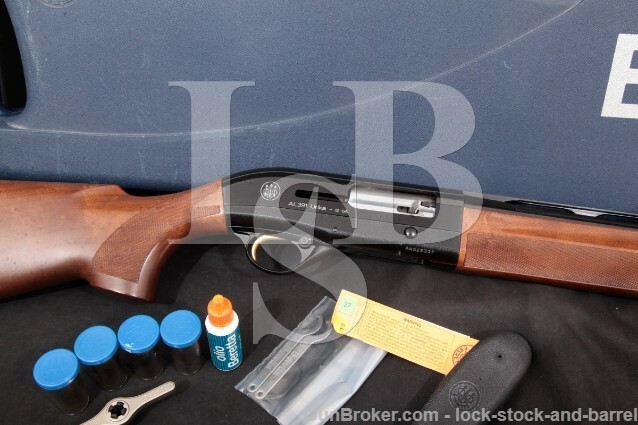 Box, Paperwork & Accessories: This shotgun comes with a blue plastic beretta case with choke wrench, chokes, replacement buttpad, oil bottle and stock spacers. The case has scattered light wear on the exterior with little on the interior, in about Very Good-plus condition. The accessories are in Fine-plus condition. Our Assessment: The Beretta AL391 Urika is a lightweight semi-automatic shotgun with a self-regulating gas system that can handle a range of loads from light target loads to heavy hunting loads. The steel and wood looks of this shotgun harken back to the earliest semi-automatic shotguns but the design and crafstmanship are all modern. This shotgun is in about Excellent condition and is ready to bust clays or drop doves! Please see our photos and good luck! CA Legal or CA Private Party Transferable: This shotgun can be transferred in California.